Just a reminder that, tomorrow night, January 25th, Aquarium Drunkard presents Jason Isbell and his band, the 400 Unit, live at Spaceland, with special guest Will Hoge. We have three pairs of tickets to give away to AD readers. 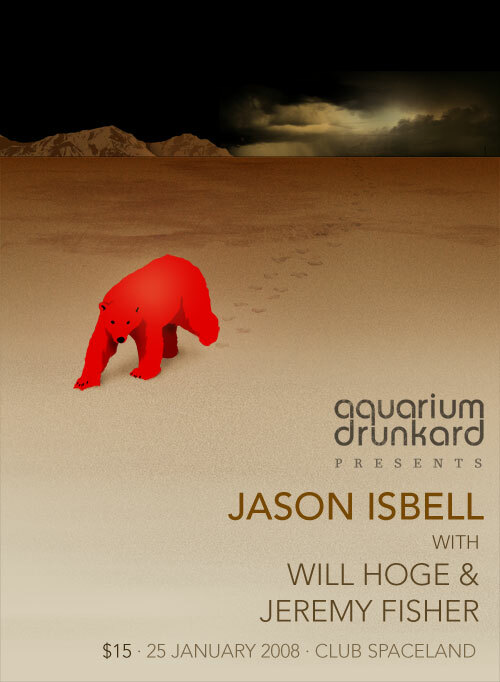 To win a pair, send an email to aquariumdrunkard @ gmail dot com with the subject: Jason Isbell – Spaceland. First come, first served. Not in L.A.? If so, we also have four 180g vinyl copies of Isbell’s LP Sirens of The Ditch to give away along with signed tour posters. To get your hands on these, send an email to the above address, with the subject: Jason Isbell – Vinyl, along with your favorite Isbell penned tune. Winners notified next week. + Download Jason Isbell via eMusic’s no risk 25 Free MP3 trial offer. + Visit The Hype Machine for additional Jason Isbell MP3s. Is there any way to purchase a copy of that poster, since I’m not gonna be able to get to the show? love, love, love the graphic! kevin, that is just an online flyer my designer put together to advertise the gig. we are not printing paper copies. Just saw Jason Isbell here in San Diego. Are Hodges and Isbell co-headlining this tour…? Isbell only played 40 minutes.